Parallel titles and other title information: Title based on subject of item. Photograph depicts long wood building believed to be the bar and snackbar at Cassiar B.C. Two men can be seen standing on one of three porches to building. 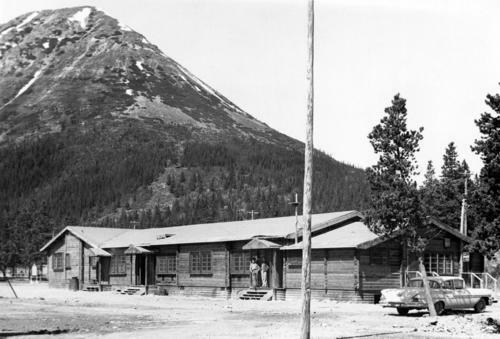 Pole, car, and trees in foreground; unknown buildings and mountain base in background. Handwritten annotation on verso of photograph: "1961". Item is one of 32 photographs taken in 1961. Photographs have been rehoused and original order maintained. Personal or academic use of photographic materials is welcomed under the standard fair use and educational use clauses of Canadian Copyright Law. Commercial use is, however, forbidden without the express permission of the copyright holder. For information on obtaining written permission from the copyright holder, please contact the Northern B.C. Archives and Special Collections. Item is part of the Cassiar Asbestos Corporation Ltd. fonds. Item is one of 32, see items 2000.1.1.3.19.1 - 2000.1.1.3.19.32. See also item 2000.1.1.3.19.52 for image featuring bar and snackbar in 1965. Original accession no. : 2000.1.1152.009 [this photograph came from box 1152].